Egypt's President Abdel-Fattah El-Sisi is expected to arrive in China on Saturday for a three-day visit that will include his participation in the summit of the Forum on China-Africa Cooperation (FOCAC), and a bilateral summit with his Chinese counterpart Xi Jinping in Beijing. Xi visited Egypt in 2016, and discussed with his host a wide range of options for cooperation. “Some have picked up, especially on transportation and energy fronts; and some are still to pick up on trade and economic cooperation,” said an Egyptian government official, who requested anonymity. “Egypt is taking China very seriously at many fronts; on the political front we see almost eye-to-eye on leading regional matters; we cooperate a lot in the framework of the UN, especially in New York, and we have really very large prospects for economic cooperation, especially that China has been proving serious about expanding its economic relations with Africa - and for that matter all across the Middle East,” the government official added. El-Sisi is expected to oversee the signing of a few agreements and memorandums of understanding between Egypt and China for trade, economy and development cooperation. “We already have a considerable profile of Chinese business in Egypt and we can easily expect to see a serious enhancement of this business cooperation in the very near future,” the same government official said. On the side of the participation in FOCAC, ElSisi is scheduled to hold a round of talks with several participating African leaders, especially those from East Africa and the Nile Basin states. According to the same government official, “President El-Sisi will hold a series of bilateral meetings to follow up on several issues, including developments related to the security of East Africa, the developments related to the Great Ethiopian Renaissance Dam and other issues of relevance”. El-Sisi had sent a message to the prime minister of Ethiopia upon a short visit of Foreign Minister Sameh Shoukry and Intelligence Chief Abbas Kamel on Tuesday. Should the prime minister of Ethiopia, Abiy Ahmed, join the FOCAC summit as expected, the government official said, El-Sisi would have a chance to follow up with him personally. “The fact of the matter is that China is a strong believer in the central state; it actually did take exception to the January Revolution and all but voiced measured scepticism over the abrupt way in which the West turned its back on Hosni Mubarak. 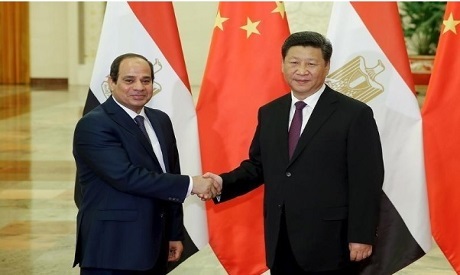 In 2013, Beijing was confident that it was again having a solid and serious interlocutor in Cairo, and more so after the election of El-Sisi as president,” Kandil said. “We are talking here about two leaders who share the same concept of a solid and powerful state institution; two leaders who see eye to eye on most regional issues, including Syria and Libya – as well of course as the Palestinian issue; we are talking about two leaders who dread Western intervention in the internal affairs of sovereign states and who would not accept the call of human rights as a basis for any such intervention,” Kandil said. Kandil is not willing to confuse the priorities of China in Africa with the path of the bilateral relations between Cairo and Beijing. “I know that some people say that China has not been helping Egypt in relation to GERD and it had not put any serious pressure on Addis Ababa to accommodate Egyptian concerns over the impact of the mega-dam on its already limited water resources, but the fact of the matter is that China is eyeing Africa essentially through the economic lens – if it has an economic interest it will go for it; the Chinese have a very pragmatic approach when it comes to business,” he said. What Egypt should expect from China at the political front, Kandil argued, relates more to the regional strategic issues rather than to any disputes or disagreements that Cairo might have with any African state. In the meantime, he added, Egypt should also relate its bilateral expectations from China to the ability of Egyptian bureaucracy and legislations to accommodate Chinese business expectations. “If our bureaucracy is slow and our legislation is not attractive than we will not benefit as much as we could from bilateral cooperation with China,” Kandil said. According to Kandil, the prime focus of Egypt now should be on fixing the “huge trade imbalance” between the two countries. “We need to export more to China and I guess we could because they have such a huge market,” he argued. According to the government official, the talks that the Egyptian delegation is expected to hold with the Chinese official in the coming few days would certainly explore the avenues to upscale and diversify Egyptian exports to China as much as it would aim to attract more Chinese investments to Egypt. Apart from business and trade, Kandil argued that Egypt and China could expand their culture and military cooperation. “We have an established military cooperation with China that has been there for years and actually it was in 2016 that Egypt was the only African country to take part in an expanded military parade that China hosted; I guess on this front we are stable and might even be moving forward,” he said. Meanwhile, on 28 August, ahead of El-Sisi’s visit to Beijing, Egyptian and Chinese officials signed agreements to expand media and cultural cooperation. “I guess things are moving in the right direction both in terms of enhancing bilateral cooperation and diversifying Egyptian political and diplomatic alliances – the latter especially being a target that El-Sisi had committed to since he came to office; of course this has to be done within a carefully measured fashion to avoid getting into unnecessary confrontations with old and essential allies like the US, but I think we are making decent progress,” Kandil argued. According to political science professor at the American University in Cairo Moustafa Kamel El-Sayyed, China is important to Egypt in many ways. “There is so much that we can learn from the Chinese experience; they have an extremely impressive experience in enhancing the use of savings for investment and this was a real booster to the Chinese economy; they also have a very impressive experience in upgrading the quality of their education; and their advances in scientific research are no less impressive,” he said. It is important for Egypt to try to attract more investments from China, El-Sayyed agreed. “But what is more crucial I think with a country like China is to learn from their successes on many fronts,” he added. Meanwhile, El-Sayyed stressed that the Chinese interest in Africa is allowing Beijing the opportunity to move forward with its ambitious Belt and Road Initiative that starts in East Asia, through South Asia into the Arab Gulf, East Africa, the Red Sea, the Suez Canal and onto Europe. This, he said, is only part of a larger interest that China has in Africa, which allows an incredible venue for Chinese business. Egypt and other African states, he added, should make sure that they too get their interests out of their partnership with China “in terms of development and not just business”.